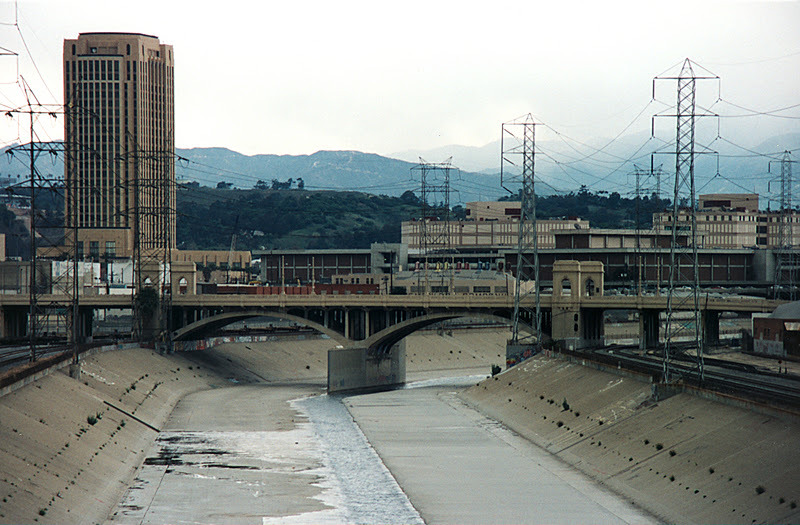 Unlike the Cesar E. Chavez Avenue Viaduct, the First Street Viaduct crosses the Los Angeles River in two shorter (148 ft) arch spans. Also, the neo-classical porticos are not as embellished as on the Cesar E. Chavez Avenue Viaduct. The First Street Viaduct was designed by Los Angeles city engineer Merrill Butler and opened in 1929. It is a twenty eight span viaduct that is 1327 ft long and is 71 ft wide with four traffic lanes. The bridge is currently being widened 26 ft (8 m) to accommodate the Gold Line Metro that will run down the middle of First Street. Los Angeles River Bridges: First Street Viaduct by Mark Yashinsky is licensed under a Creative Commons Attribution-NonCommercial-ShareAlike 3.0 United States License.